Did you know I can also book you your flights? I work with a fantastic flight specialist who can find the best pricing and routes for your travel when you fly Premium economy, Business or first class internationally. In fact, it’s common that we can even find fares lower than published rates. The service also includes VIP service, for an example if there is an issue with your flight day of or ahead of time, we work with the right people to fix issues ASAP with your tickets so you don’t have to wait on hold forever with the airline. Booking Service Fee: Subject to a $50 per person (at times this can be waived depending on destinations and airlines). I can also book economy domestic and international but most often prices will be same online and the service fee is additional. 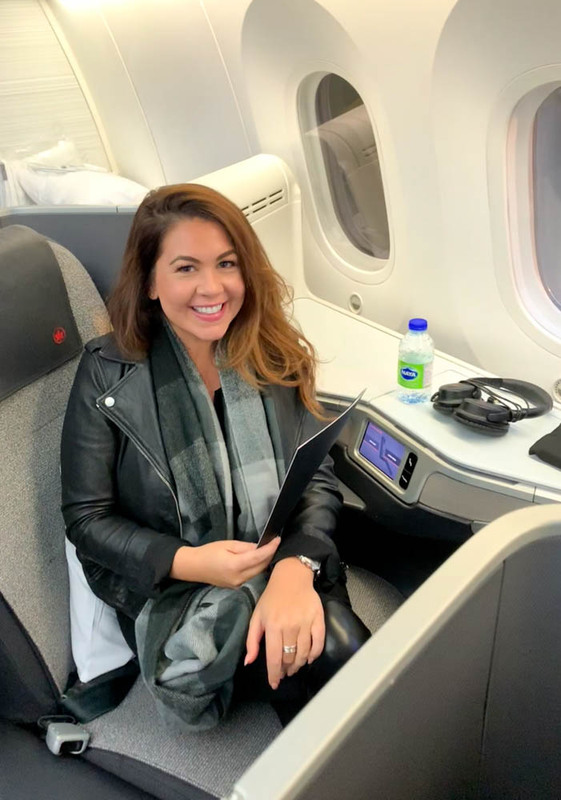 I recently flew Air Canada Business Class from Newark to Vancouver on the Dreamliner 787 800 and let me tell you-I was impressed. It looks and feels brand new. Your individual seat pod is perfectly setup with a large down comforter, sound proof headphone, toiletry kit and a pillow. There are 20 cabins in the business class section. service and they will greet you by name once you sit down with a glass of champagne… I liked this personal touch! They begin the process of meals with a light snack of salted peanuts. Next, they’ll continue with 4 courses. This is a flexible meal option, you can choose one of the main courses to be served with bread or mixed greens. For my main course, I chose the salmon skewers over salad and it was good (not great, but remember this is airline food, and so good is GOOD). Of course, you’ll select your beverage, and for me, it was red wine and sparkling water! The seats completely lay flat and there is plenty of space for your feet at the front of the seat (another built in luxury-I LOVE to stretch out on a flight!). Large flat screen TV with multiple movie choices, games and an interactive moving map of the flight all on a touch screen technology.